Twelve Ghanaian companies based in the UK have been honoured for their dedication, drive, industry and excellence. The companies were honoured at an awards night to climax a one-day Ghana-UK Business Forum held in London by the Industrial Pinnacle Africa Network as part of the business and investment promotion drive of the country. Dignitaries present at the event included Mr. Kwabena Baah-Duodu, Deputy High Commissioner, who was the Special Guest of Honour, Prince Kofi Kludgeson, President of the Association of Ghana Industries, Mr. Solomon Quartey, President of the Ghana National Chamber of Commerce, Mr. S.S. Saaka, Chief Director, Ministry of Private Sector Development, Prof. A. S. Anku of the Asheshie University, Prof. A. Ayensu of the Council for Scientific and Industrial Research, Dr. Peter Ankra of the GIPC, representatives of British business organisations, opinion leaders and friends of Ghana. 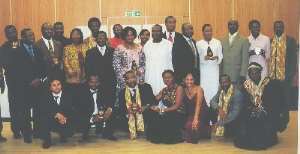 The companies, which won the awards, are Ghana Tours, operators of the Britannia flights to Ghana – for dedication, industry and perseverance; OBE Television – for its breakthrough in the electronic media; Unity Link Money Transfer – for speeding up the momentum in the money transfer operations in London, Regalon International which has a new branch at Osu, Ghana and serves as a one-stop shop in London for purchase of houses and land. The Ghana Review Magazine as the leader in the UK/Ghana print media and the Ahenfie Restaurant for consistent performance and excellence. Other companies honoured included Kumasi Market – for being the best Ghanaian retailer in the UK and Europe; Kut and Payste - as the best Ghanaian communications and marketing company; Uncle John's Bakery – as the leading Ghanaian suppliers of bread to markets in the UK and Europe; Excell Marketing Consultancy – for effective projection of the image of Ghanaian professionals; Roshview International – for its pioneering role for Ghanaian private sector shipping business in the UK and Emmanuel Hair and Beauty Salon – for excellence and productivity. Speaking on behalf of the awardees, Mrs. Catherine Ampah who led the OBE Television team praised the organisers for their foresight and initiative. She said the award would serve as encouragement to all Ghanaian companies and industrialists in the diaspora. In the keynote address read on behalf of the Chairman of the Board of the Industrial Pinnacle Awards and Deputy Minister for Tourism and the Modernisation of the Capital City, Hon. Abu-Bakar Sadique Boniface, Mr. Kwabena Baah-Duodu stated that the Industrial Pinnacle Awards had been instituted to identify, honour and reward corporate bodies and Ghanaian individuals who had demonstrated excellence in entrepreneurship and technology in their contribution towards the growth and development of Ghana. He expressed the hope that the awards would encourage award winners to strive for the best. He urged them not to rest on their oars but should endeavour to justify the confidence the IPA had reposed in them by providing guidelines and support to up and coming companies who might also wish to enter their fields of operations. The Deputy High Commissioner explained that the IPA was not meant to duplicate or supplant the Ghana Professional Awards (GPA) organised annually in the UK by Excell Marketing Consultancy. The IPA, he continued was a government-private sector initiative which covered only business and industry while GPA covered a wider field. In his closing remarks, Mr. F. M. Akron-Botsway, Chief Executive of Industrial Pinnacle African Network, thanked all participants and sponsors through whose efforts and contributions the initiative had come into fruition. He described the event as the beginning of what the future held for industrialists in the Diaspora and added that the forging of useful partnership and cohesion with their counterparts in the UK would enhance their operations.